Vizzee Rascal | Gwilym Lockwood's blog about turning numbers into pictures. Vizzee Rascal – Gwilym Lockwood's blog about turning numbers into pictures. It’s 2019. Hooray. The change of a year is one of my least favourite things, professionally speaking, because January 2nd is when you find out how much stuff breaks because somebody (possibly you) has hard coded a date somewhere in all your pipelines. Suddenly, all your dashboards are blank because somebody’s put filter Year=2018 on, or all the YoY calculations are off because it’s looking at / instead of [CurrentYear]/[PreviousYear]. Sure enough, I spent a few days in January tracing through several Alteryx workflows and looking for rogue date filters. Pretty much all of them could be fixed by changing 2018 to DatePartYear(DateTimeNow()). But it was a long and frustrating process to identify all the filters which needed to remain static (e.g. filter out everything before 2018 because older data is in a different format and needs to be treated differently) vs. filters which needed to be dynamic (e.g. 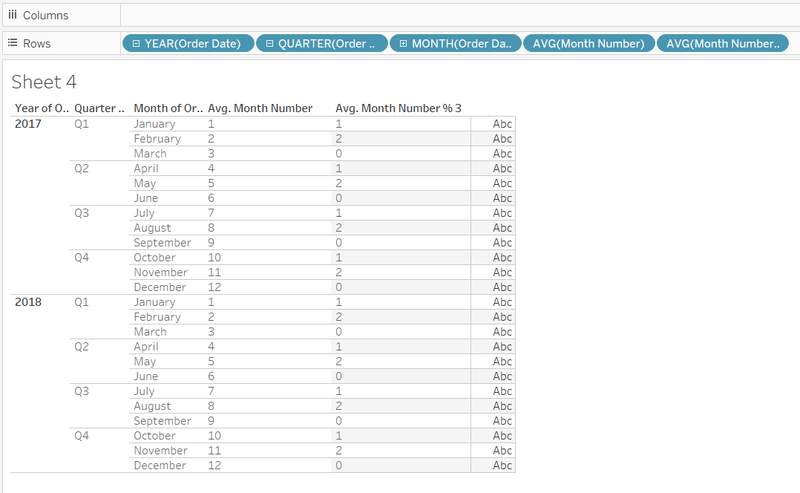 filter to the current year’s data to show YTD values), and then replacing the filter code in the custom filter section. Just hit download and stick it in your standard macro path. It’s automatically set up to appear in your preparation tools. It works much like a regular filter tool, with T and F outputs based on a filter condition. But instead of coding up a calculation like “DatePartYear([MyDateField]) = DatePartYear(DateTimeNow()) AND [MyDateField] <= DateTimeNow()” for a Year-to-Date filter, you can simply tick the Year-to-Date option (and see a description of what that particular filter option will do). I built this with scheduled workflows in mind so that you can spend less time copy/pasting chunks of date filter code, and less time trawling through custom filter code when the year changes and the workflows break. One caveat: this macro works at the day level, rather than the specific time level – so if it’s 7pm on March 19th when you run the workflow and select Year-to-Date, the filter will include future values from later in the evening on March 19th, not just the ones up to 7pm. I don’t use the modulo function (which is just % in Tableau) very often, but every so often, I find a really handy solution to something which uses it. In this case, it was a neat way to only show full quarters of historical data. Nice and simple, no filters or restrictions – these are the sales by segment per quarter across the whole data set. 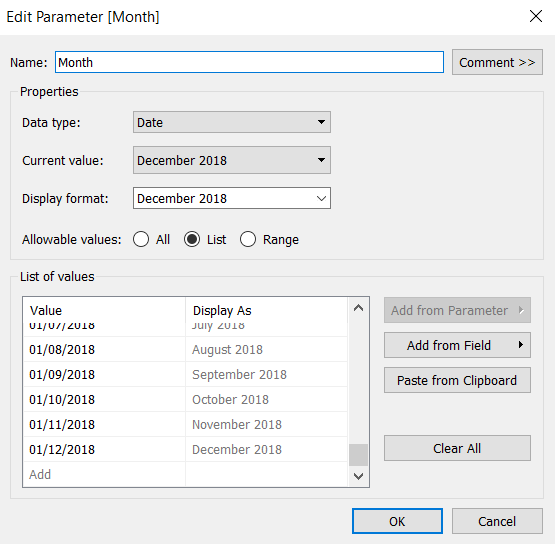 …and that can be combined with a Last Twelve Months filter, which will filter the data to the twelve months up to and including the month selected in the parameter. So, if you select November 2018, it’ll show you all the data between 1st December 2017 and 30th November 2018. What’s happened is that the Last Twelve Months filter has worked exactly as it’s supposed to; it’s filtered the data from 1st December 2017 to 30th November 2018. But the problem with that is that 2017 Q4 only has one month of data in it, and unless you stop to think about it, you could be misled into thinking that there really were more sales in 2018 Q1 than 2017 Q4. Instead of filtering to exactly the last twelve months, we could filter to however many months it takes to show the current quarter and the previous three full quarters. So, if that’s November 2018, that would be October and November 2018 in the current quarter, and the three full quarters before that, from January 2018 to September 2018. If you select October 2018, it’d just be October 2018 in the current quarter, and then also from January 2018 to September 2018 for the three quarters before that. This is where the modulo function comes in. You can create an if statement to change the number of months to filter to depending on how far through the quarter the selected month is. The modulo function returns the remainder left over when you divide by a particular number, so for our purpose, we can use the modulo function with the month number to work out how far through a quarter that month is. There are three months in a quarter, so we can use the month number % 3 to work out what the remainder is when we divide the month number by three. This will return the same number for each month at the same stage of a quarter. 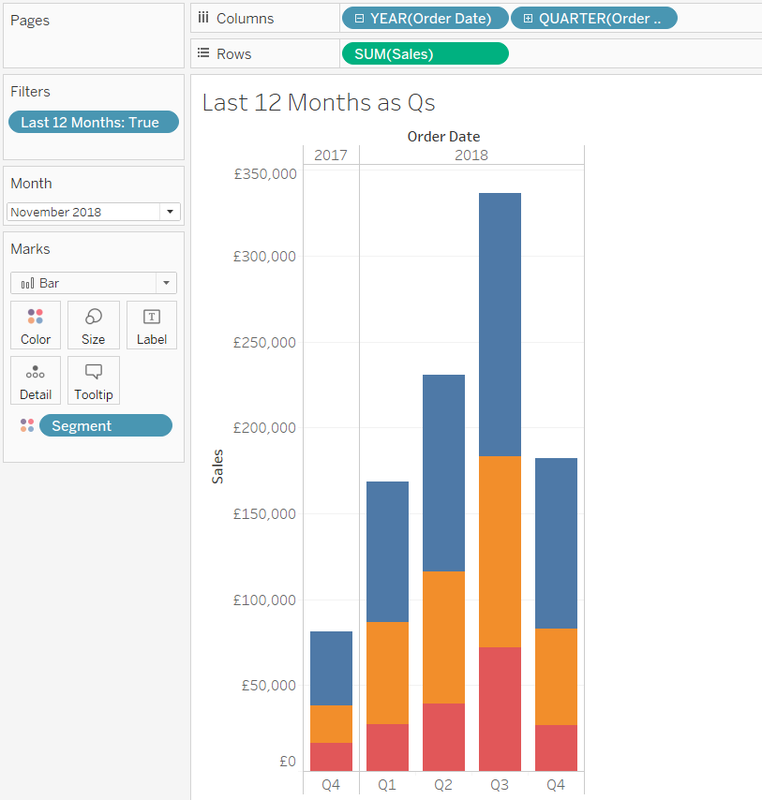 This means you can see full quarters within a custom time range without seeing misleading quarterly data, and without using table calculations or LODs. 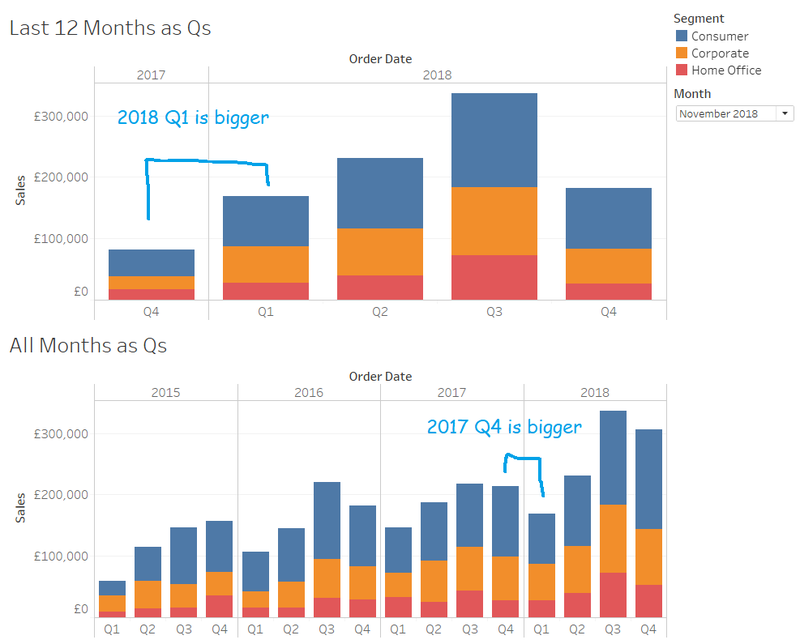 We chase the waves: how to make a sinusoidal time series in Tableau. 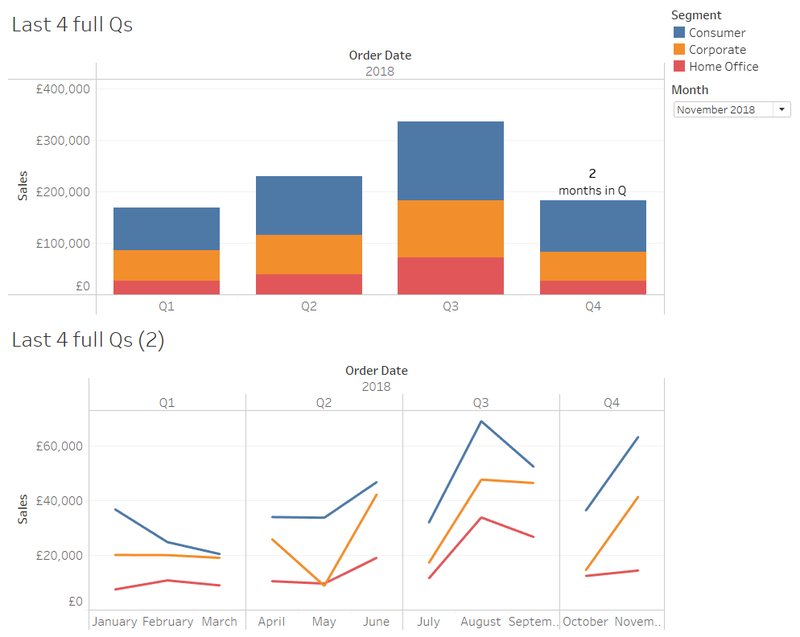 Browsing what other people have done on Tableau Public is a great source of both challenge and inspiration. Recently, I’ve been really taken with Neil Richards’ visualisation of football league winners over time, with a beautiful sine wave showing how long it’s been since each team last won the league. 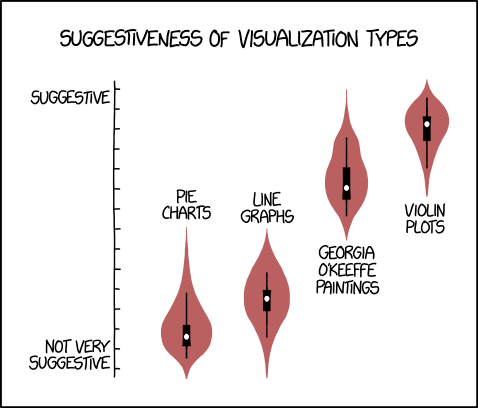 I’ve no idea what to call these plots, but they’re fantastic (click image to see Neil’s original on Tableau Public). I’ve wanted to take these apart and see how they work for a while, and finally got round to it the other day. It turns out that Neil did a lot of the angle calculations outside Tableau, which is fair enough… so I set myself the challenge of doing it all with table calculations. I got there eventually, but it was a good workout. This blog is a walk-through of how to do it. Instead of football data, I’ve used official pope names; I was on a wikipedia spiral and noticed that seven of the eleven popes between 1775 and 1958 were called Pius, taking the Pius count from VI to XII. Naturally this reminded me of Barcelona’s recent league dominance, winning six of the last nine La Liga championships, so it seemed obvious to see if the chart for pope names would be similarly tightly woven. Come to think of it, if you’re good with INDEX() calcs, you might not even need the PopeNameNo column… but I’m not, so I do. You’ll also need a simple scaffold sheet with 100 points, going from 0 to 99. If you’re trying to visualise something with more data points than the 267 popes I’ve got, you might want to whack up the scaffold to 999 instead. Read the two files into Tableau, and create a calculated join with “x” in the join field for the popes data, so that there are 100 points for each pope. Now we’re ready to do some vizzical jiggery-popery! Here’s all the Leos, in order. It was a fairly popular (pope-ular?) pope name in the later part of the first millenium, but then it fell out of favour for a while, with almost 500 years between Leo IX in 1054 and Leo X in 1513. This is why we’ve got the scaffold table. We can’t just connect two points with a curvy line – or at least, I can’t. Instead, we need to put a load of dots between the two main points, and connect them up. That means figuring out the x and y axis values to put those dots in the right place to connect the two main points with a nice sine wave. This is working nicely – I’ve stuck it on the tooltip, and hovering over Leo IX, who’s pope number 153 in my list, tells me that the next Leo is pope number 218. There are 100 scaffolding points, going from 0 to 99. If it’s the first one, i.e. 0, give it the same value as Pope ID. For the Leo IX to Leo X example, this is 153. If it’s the last one, give it the same value as the next Pope ID with the same name. For the Leo IX to Leo X example, this is 218. If it’s any of the rest, calculate the difference between the two Pope ID values (i.e. 218 – 153, which is 65 pope units), and then divide that by the maximum point value, which is 99 (if you made your scaffold points 1-100 instead, you’ll have to set this to maximum point value -1, not 100). This is because there’s 99 spaces to fill between all the scaffold points. Then multiply that fraction by the number of the point, and add it to the Pope ID value. In our case, we don’t want a wave between 0 pope units and 3.141… pope units; rather, we want to define the beginning and end of this phase of a sine wave to be between one pope and the next pope of the same name. So, for Leo IX to Leo X, we want 153 to be our 0 and 218 to be our π. That means taking the scaffold point, dividing it by the maximum point of 99 to get the % of the distance that that point is along the 0-to-π scale, and then multiply it by π. So, stick the y-axis calc on rows, set the table calculation to calculate using Pope and Pope ID, and voila! We have a nice set of sine waves between our Leos. Delightful. The rest of it is all about making it pretty, which I can leave to your personal tastes. But the real question is: what happens with Pius, the Barcelona of second millenium popes? Can we clearly see the era of Pius dominance? These graphs can be applied to basically anything that goes in a sequential order and may or may not have repeated values; this graph here is every word from my old band’s EP in order. I like how you can see where the choruses are, because the lines get more tightly woven as the words in the chorus are repeated more often. I hope this blog makes it clear how to make these graphs! I still don’t know what to call them, but in my head they’re unimaginatively down as sine wave time series. Thanks again to Neil for creating them first, and for making his workbooks downloadable and play-around-withable! The Gaslight Analysis: when sentiment analysis doesn’t quite work. I love sentiment analysis. It’s a great way of getting fascinating insights from a glut of text data. You can take a load of Yelp reviews, figure out how people feel about a place, and cross-validate it with the star rating. You can take the works of Jane Austen and plot narrative arcs. You can look at the texting styles of you and your girlfriend. If you’ve got a dataset with clear sentences in standard textbook English, you can find out all sorts of things. But, here’s the thing with language; it’s gloriously, infuriatingly messy. That makes it really hard to do really good sentiment analysis – certainly with the free, widely-available tools. Most of those assign certain emotional values to specific words; for example, in the NRC dataset often used with the R package Tidytext, the word “alive” has associations of ANTICIPATION, JOY, POSITIVE, and TRUST, while the word “afraid” has associations of FEAR and NEGATIVE. The second sentence is pretty obviously negative, but it works by negating words. The word “good” isn’t actually good, because it’s being negated by “don’t” a couple of words earlier. And “love” isn’t a positive emotion here, as it’s expressing the desire to get out of the situation, meaning that what’s going on is not a positive thing. It’s possible to address this with sentiment analysis, but it’s complicated. You’d have to account for every possible way of negating/reversing a word, and there’s a lot of those. You’d have to account for every possible way that a word that’s positive in isolation could actually be referring to a negative overall situation, and that’s a huge task. This is why good sentiment analysis costs a fortune. It’s really complicated. Luckily, people tend not to speak indirectly all the time, and in aggregate, the twisting, sentiment-negating sentences are cancelled out by the number of straightforward sentences where word-level sentiment analysis does work. But the caveat is that just because you’re using sentiment analysis, that doesn’t mean you’re using it well, and you should really cross-validate it with some other measures. I really like his music. I’ve used the Tidytext package in R for doing sentiment analysis before. This time, I’m using the same NRC sentiment dataset, but trying it out in Alteryx instead. I’ve also visualised it in Tableau, and you can click any of these images to go to an interactive link where you can play around with it yourself. Looks pretty good so far. Here’s lookin’ at you, kid is a wistful, regretful song; definitely on the negative side, quite a bit of sadness, very little joy. Click the graph to explore other Brian Fallon songs, if you know them. This accounts for the difference between positive and negative words, as well as the number. For example, if one song has 10 positive words and 5 negative words, and another song has 6 positive words and 1 negative word, the difference is the same, but the second song is more positive overall, because it has far more times the number of positive words than negative words. There’s a nice mix of positive and negative songs, and if you know the songs, some of them definitely feel right; Here’s lookin’ at you, kid is negative, so is Get hurt, while 45 is an upbeat, positive song. But there’s definitely some weird ones in there. We did it when we were young is a sad, regretful song, but it’s up there in the top half of positive songs. That doesn’t seem right. Spotify has Here’s lookin’ at you, kid as one of the most negative songs, along with Cherry blossoms, which seems about right to me, but has We did it when we were young as a pretty neutral song, which still doesn’t feel right. Have a look at the difference with Blue jeans and white t-shirts, as well – it’s one of the most negative songs according to Spotify, but one of the most positive according to sentiment analysis. I’d put it somewhere in the middle, maybe a bit more positive than neutral. Since I keep using my own perspective as a fan and a human, I figured I’d better cross-validate both of these stats with what fans think. I set up a simple survey where to get Brian Fallon fans to rate each song for positivity on a scale of 1 to 7, where 1 meant really negative, 4 meant neutral, and 7 meant really positive. I stressed in the introduction, several times, that it’s not a rating of how much you like each song, or how positive each song makes you personally feel (like, I really like Fallon’s sad songs because they make me feel nice… but they’re still objectively sad), but about the emotion in the song itself. Around 15-20 fans answered for each song, so I averaged their ratings together to get a human-generated emotion rating per song. It’s not the most scientific approach, but it’s good enough for the purposes of this blog. This time, Blue jeans and white t-shirts comes in as I see it – fairly positive, but not hugely so. We did it when we were young is down there in the negative range, along with Get hurt and Here’s lookin’ at you, kid. Blood loss is the most consistently rated, with a rank difference of only four places, while The backseat has a massive rank difference of 81 – fans put it as the second most positive song in Brian Fallon’s catalogue, while sentiment analysis rates it as 83rd, ahead of only I believe Jesus brought us together and I witnessed a crime. Spotify puts it at 24th. I’ve run simple correlations on each plot – not exactly statistically kosher, but this is all just exploratory. There is no correlation between valence and sentiment analysis, and more tellingly, no correlation between sentiment analysis and fan ratings. There is a correlation between valence and fan ratings, but it’s not particularly strong. The overall point, then, is to be careful with sentiment analysis. It’s not that it doesn’t work – it can often work really well, and be a really useful line of investigating data. But relying on sentiment analysis alone, without checking whether it matches measures that should reflect the same kind of thing, might give you some false insights. You don’t want to have Great expectations, or you might Get hurt. The growing gap between the Premiership’s Top Six and the rest. This is my first football data blog for a while, and I feel all nostalgic! It’s nice to dive into some league table data again, and even nicer now that I have Alteryx; I was able to format my data about 10x quicker than I was in when I first started doing this in R. Then again, I’ve probably also spent 5x more time using Alteryx than R in the last year or so. Anyway. I’ve been hearing a lot more analysis of the Top 6 in the Premiership recently. I first noticed it in the last couple of seasons, when I saw a few journalists/people on Twitter writing about a “Big Six Mini-League”. Liverpool often seemed to do quite well at this, and Arsenal often seemed to do quite badly at this. Neither team won the actual league. I’ve started looking at how the Top 6 sides in the Premiership perform each year (using data from this fantastically well-maintained repository), and there’s quite a few interesting stories in here. The first main point is that the big clubs are accelerating away from the rest of the league. The second main point is that any big six mini-league doesn’t really matter, as you can win the Premiership with an underwhelming record against your main rivals if you trash everybody else. I mean, that shouldn’t be much of a surprise – if you’re a Top 6 team, only 30 points are on offer from matches against your rivals, but you can potentially take 84 points from the 28 matches against the rest of the league. For all these analyses, I’m taking Top 6 literally – meaning the teams that finish that season in the top six positions. Nothing to do with net spend, illustrious history, shirt sales in Indonesia, or anything like that. I then look at the average points-per-game changes by team, position, season, and Top 6/Bottom 14 status. I also filtered out the first three seasons of the Premiership to keep it slightly easier for comparison, since there were 22 teams in the league until 1995-96. Teams finishing in the Top 6 scored around 0.6 points-per-game more than the rest of the league in the early nineties, but that’s now up to over 1 point-per-game in the latest couple of seasons. That half-a-point difference translates to a 19-point difference across a whole 38-game season. 1. Only a handful of teams have ever done better vs. the Top 6 than the rest of the league. This seems to have no effect on final position. 2. It’s possible to win the league with a poor record against the Top 6 by consistently beating everybody else. Manchester United won the league in 00-01 and 08-09 with only 1.3 PPG vs the Top 6. 3. Manchester City this year are ridiculous. And if you want to explore other teams and seasons, there’s an interactive version of all these graphs here. Why won’t my Tableau small multiples chart work? 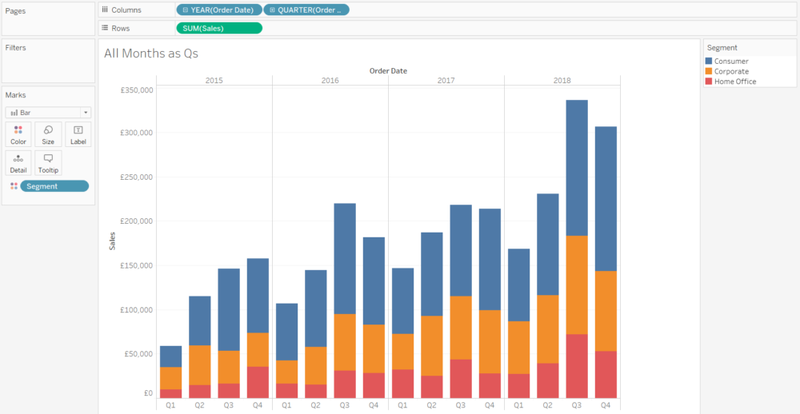 Andy Kriebel wrote a great tutorial on how to make small multiples charts in Tableau here. It works pretty much all the time… but you’ll also find that if you simply copy and paste the calculations, it might not work with your data. It turns out that the rows and columns calculations can’t handle nulls in the underlying dataset. I haven’t dived into this fully, but I’m guessing this is because the index calculation works depending on what’s in the view, rather than being fixed on all the subcategories and months regardless of whether there’s data or not. In this case, what happens is that the October 2014 missing data for one one category – Accessories – shunts everything else up one; the Appliances value turns up in the Accessories small multiple, the Art value turns up in the Appliances small multiple, and so on. The same thing would happen in March 2014 if there was another subcategory after Tables too. You’ll see that if you switch to calculating using quarters instead of months, this problem disappears completely. Andy’s calculations are great because they’re really flexible, and they’ll work fine without much further adjustment most of the time. But if you get issues with null data like this, you can try this alternative instead. With these calculations, I’m going to hardcode the small multiples by whatever thing you’re splitting up the view by. That means that you’d have to create separate fields for every dimension you’d ever want to do it by, which is extra work, but it does take care of the nulls issue. First, create a calculation called Number (or Subcategory ID, or Steve, or whatever suits you). This is a case statement which assigns a number from 0 to N-1 for a particular dimension. It’s crucial that you use the same constant each time! I’ve used 4 because that’ll give me 4 columns across the top, meaning that the 17 subcategories in superstore will be split over four rows of four columns and a fifth row with one column, exactly like Andy’s small multiples do. If you want to do it another way, you could use 3 instead. That would give you five rows of three columns and a sixth row of two columns. There’s a lot of playing around with the configuration, but it’s also more flexible in terms of the configuration you want to plot. Just to make sure, let’s colour code it by subcategory too. No differently coloured dots in the wrong places anymore! Another advantage of this approach is that you can colour the graphs by another field. You can do that with Andy’s calcs too, but you have to be careful about how the table calcs work and what they’re using to compute the calculations. Because my calcs don’t have index() in them, there’s no table calc issues to worry about. Just drag and drop.